Weave this Easter Basket Weaving Kit with Japanese oval base, #1, #4 & #6 round reed, flat reed accent, closed border, twisted handle. Fun and Easy pattern with beautiful results! 9.5" long, 8" wide, 4" tall to rim. Adult Beginner Level. 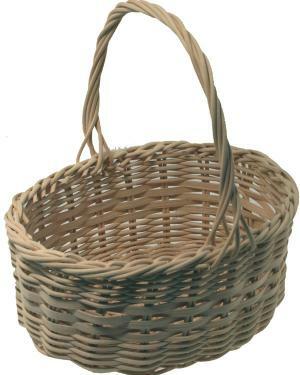 Show your unique style on this basket by adding ribbon (not included) or other Spring decorations (not included). Start a Tradition! These Easter baskets can be saved from year to year, and eventually be handed down to the next generation of Easter Egg Hunters. This kit now comes in two sizes: Makes 1 basket or Makes 3 baskets. Make your selection from the Drop Down Menu. Weaving Easter Baskets with others for the big Easter Egg Hunt? Get our Easter Basket Extra Materials Pack or Easter Basket Teachers Special and everyone Saves! SKILLS LEARNED: Oval Base with reinforced ends, plain weave with round & flat reed over an odd number of spokes, simple round reed border, how to twist and apply a round reed handle.